Paxi or Paxoi and Antipaxoi or Antipaxos is the smallest island group within the Ionian Islands. In Greek it is a plural form. The largest islands are Paxos and nearby Antipaxos. Antipaxos is famous for its wine and two of the finest sand beaches in the Ionian Sea. The main town of Paxoi, and the seat of the municipality, is Gaios. The municipality has an area of 30.121 km2.. The area of the island is 76 square kilometers = just under 30 square miles. In Greek mythology, Poseidon created the island by striking Corfu with his trident, so that he and his wife Amphitrite could have some peace and quiet. The island is approximately eight miles in length and tipped up towards the west. 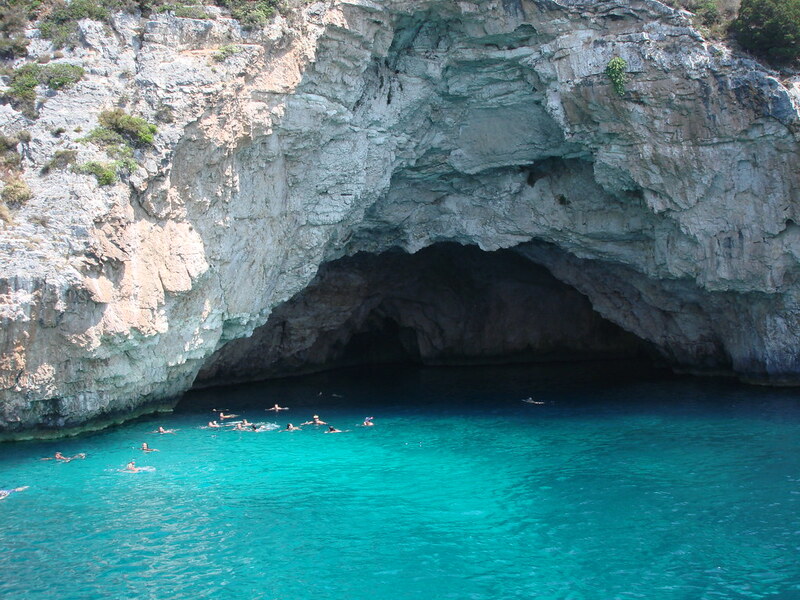 The west coast is dominated by steep white, chalky cliffs that are greatly eroded at sea level, and harbour many 'blue caves', which can be explored on launches departing from Gaios. Much of the attractive landscape is still covered in olive groves. These stretch from Lakka, the harbour community in the north, through Magazia to Gaios, the capital. Olive oil making, soap manufacture and fishing were supplanted by tourism as the main industry in the mid sixties, resulting in a construction boom, which has greatly altered the coastline around Gaios, the capital of the Paxiot demos. There are ferry and jetfoil connections daily with Kerkyra and with the mainland at Igoumenitsa. Excursions via Corfu to Albania can also be arranged with the local jetfoil operators. The blue markers shows the location of various accommodations in Lakka (Paxos). The letter in the marker describes the accommodation types: H for Hotel, A for Apartment, R for Resort, B for Bed & Breakfast and O for Other (e.g. pension, villa). Click on the blue marker for more information on the accommodation.